So you’ve finished carefully drawing out a composition for a new painting. You love it, it’s ready and it’s time to put it on the canvas. 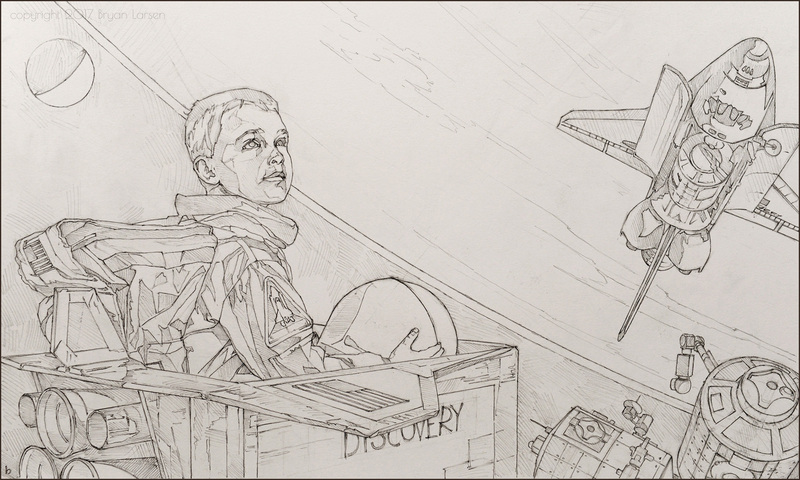 Mine is 16 x 32 inches… large enough to get at the detail of the drawing, but small enough to be fully visible while you’re working. You’ve got to keep those proportions straight. You’ve also stretched and primed a lovely 60 × 30 inch linen canvas. It’s bare and ready to receive your creative genius! 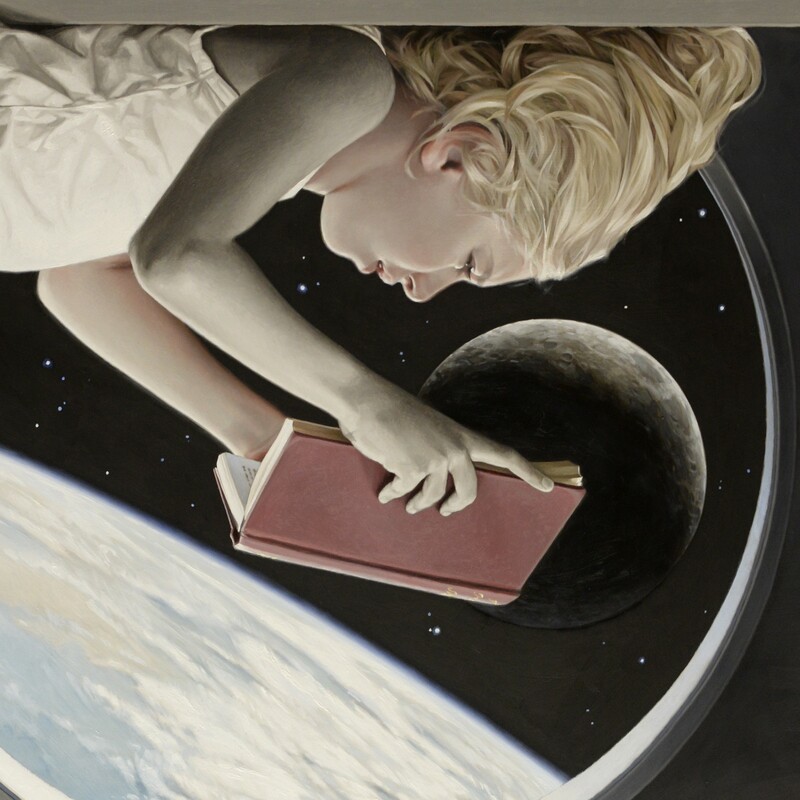 But how do you get that drawing onto that lovely canvas? For something this size, my method is to use a charcoal transfer. Your first step is to take your drawing down to your local copy shop (thanks Kinkos!) and blow it up to the size of your prospective canvas. Using a little ratio math, that works out to around 187.5% for me, but I like to go just a hair on the small side to make sure the entire image fits on the canvas. It will have just a bit of extra space around the edges, which the frame will most likely eventually cover anyway… so let’s say 186%. 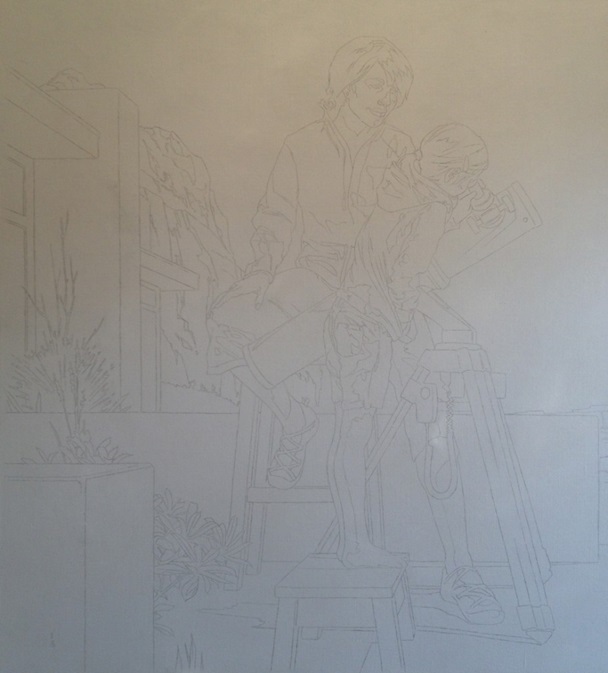 I also like to lighten the image a little so I can see my traced lines later on in the process. Once you’re through the mayhem of working with your shop to get the drawing blown up, head on back to the studio. 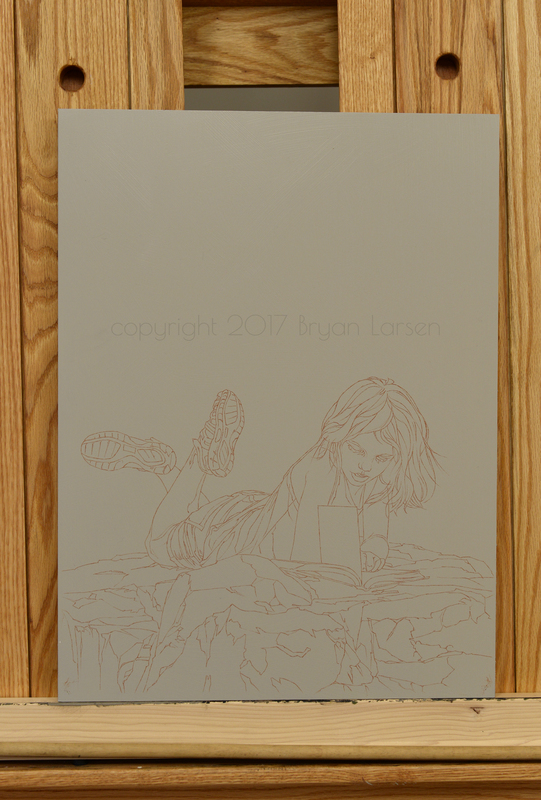 Next step is to cut out the image and, on the back, mark out any large areas where there is nothing to transfer. I hold the paper up to a window… free light-box! Yay! Then lay the drawing out face down on a work surface. 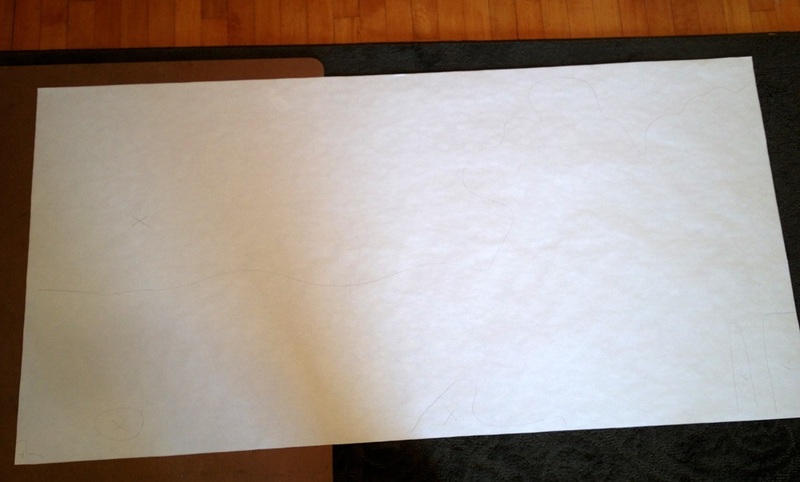 For this large of a drawing, my work surface is the floor – super glamorous I know. (I’m still pining for a backyard studio/shed dream.) 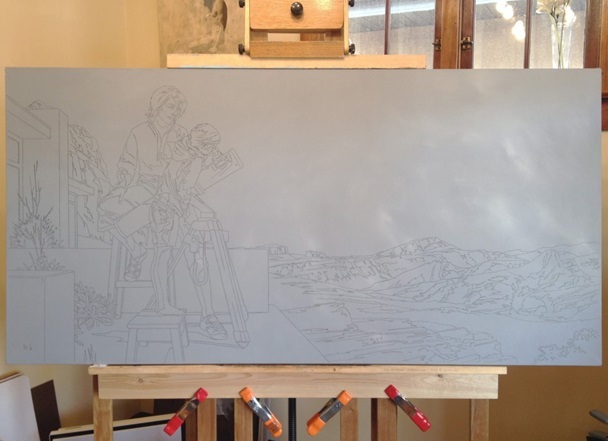 I also have a large piece of masonite that I can move around under the drawing as I work. I’ve purchased a couple of soft charcoal sticks (I’ll probably go through both) and I’ve got a roll of paper towels handy. The basic idea here is to cover the entire back of the copied drawing with charcoal anywhere that there are lines you want to transfer to the canvas. WARNING: It’s ridiculously messy, but I usually manage to keep the bulk of the charcoal on the paper. I wouldn’t recommend letting your toddler walk through during this stage. 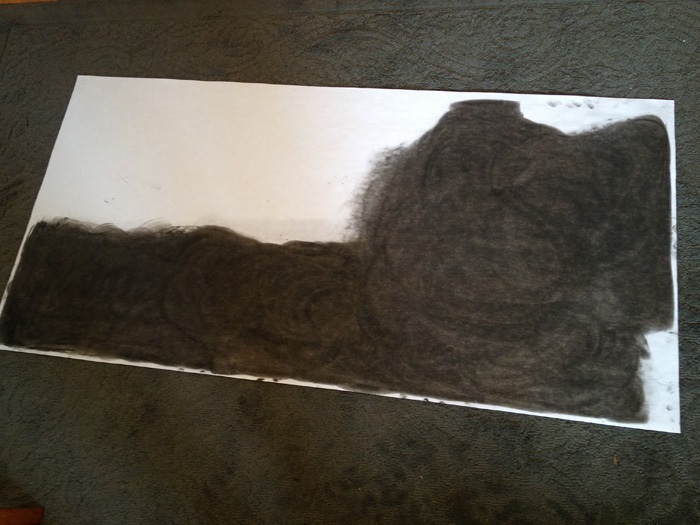 Next I use a paper towel in a circular motion to evenly work the charcoal into the paper… making it as dark as possible. Again, super messy. 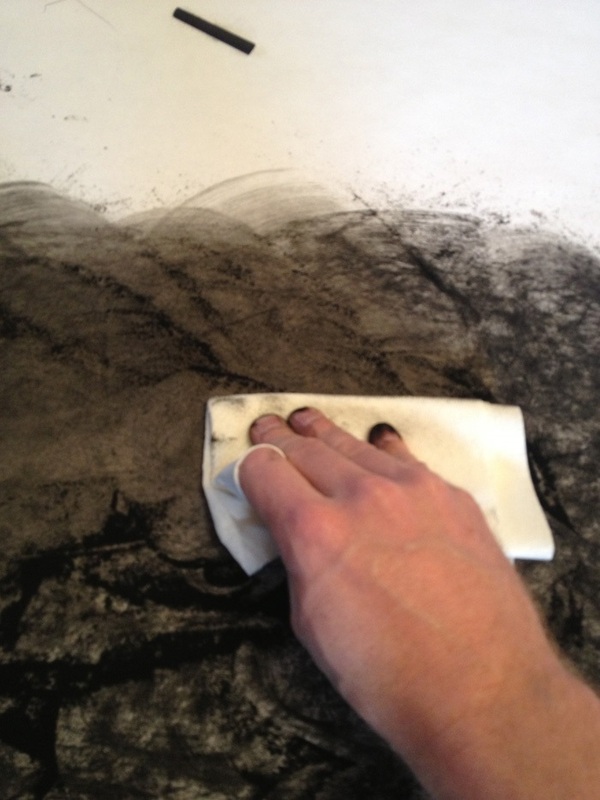 I carefully shake off the excess charcoal dust onto a spare sheet of paper and throw it out before I get it everywhere. This is a good time for some hand-washing as well. 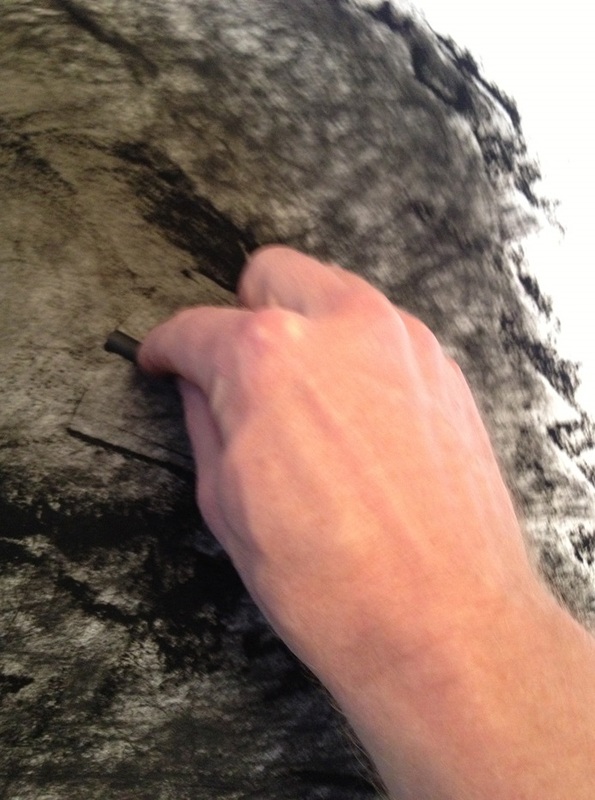 Next, I carefully position the charcoal-coated drawing over the canvas and tape it in place. Now for the tedious bit. 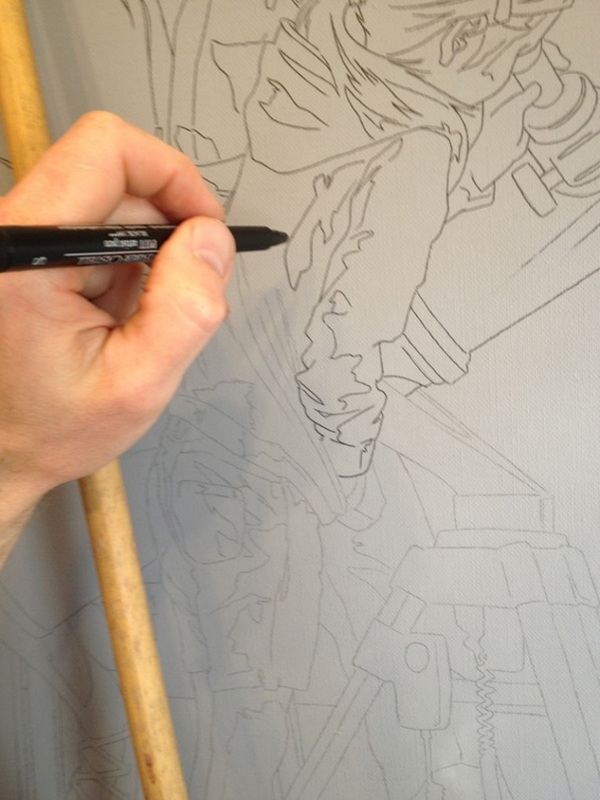 Using a maul stick to keep my hand off of the drawing, I use a ball point pen to meticulously trace over every line on the drawing that I want to have on the canvas. I use a fair amount of pressure, and after a couple of hours (I think this step took me around two and a half hours) my hand feels pretty awesome. After I pry the pen out of my hand, I then remove all the tape except along the top edge and peek under the drawing to make sure I got everything. If it looks good, I remove the drawing and throw it out. Now I have a light recreation in charcoal of my drawing on the canvas. Pretty slick, eh!! Works for many different sizes, but especially for larger format projects. 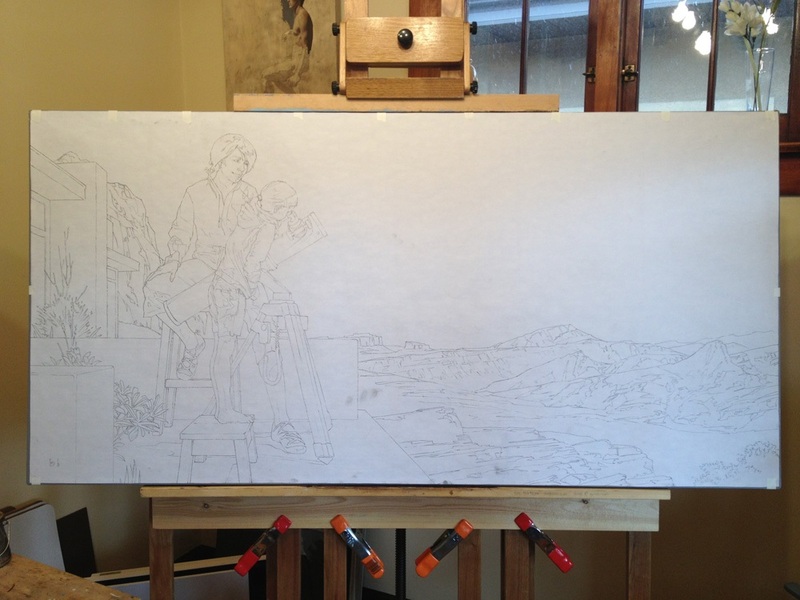 Finally the drawing is fully recreated in India ink on my lovely 60 x 30 canvas, and is ready for paint. Incidentally, this exact same process works really well with burnt umber oil paint instead of charcoal. That transfer medium has the added benefit of not requiring the final step of fixing the transfer, and it yields a very delicate, fine, and quite lovely transfer onto the canvas. It’s one downside is that the extremely thin layer of paint on the paper dries fairly quickly requiring the tracing to be done quickly. 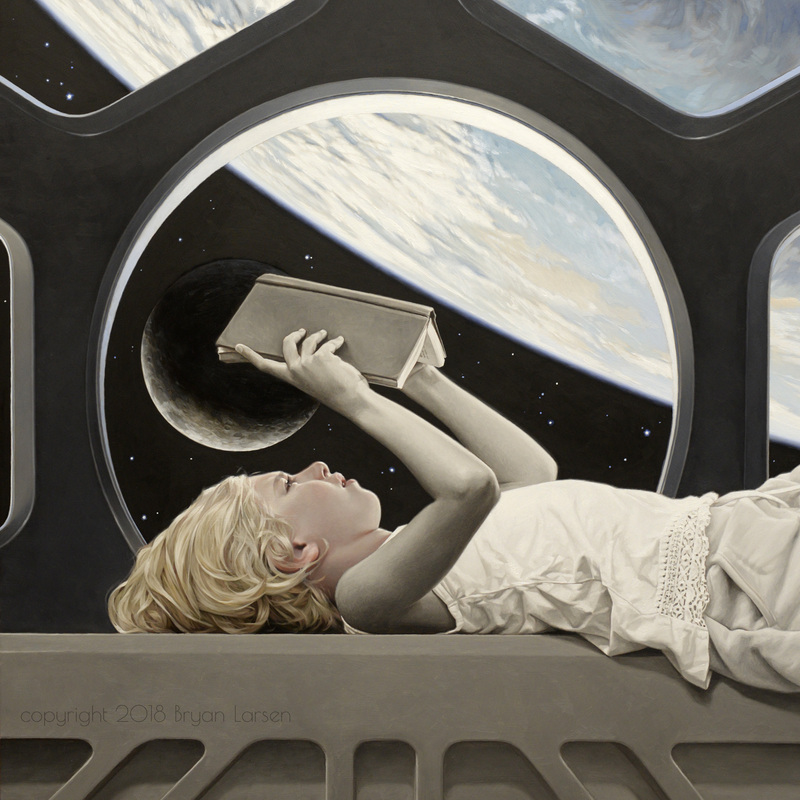 For that reason I shy away from oil transfers for large and/or complex drawings. Happy transferring! how you clean the canvas from the charcoal after you had transfer the drawing as it seem too messy. I like to use it on Ahar paper but I don’t know if charcoal damaged the paper or stain the paper, please advice. Surprisingly, it’s not messy at all. I’ve never had to clean the canvas afterword. How is it done with the burnt umber? The back of the drawing is covered in the paint and it is allowed to dry? Then the transfer can be completed? Do the transfer while the paint is wet. Sounds weird, but it works! His would work for an oil painting, correct? Acrylic would not stick to the dried oil I am assuming. All the techniques I’ve posted on are for oils. 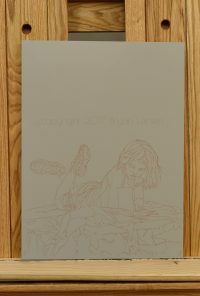 For Acrylic you would need to use transfer paper or charcoal to transfer the drawing. I hope I understood your question. Hi, I use a photo copy with carbon paper underneath, quick and easy. Also make the copy bigger to fit your canvas. I print image in size I want which requires taping together. Then place directly on canvas with carbon paper under. 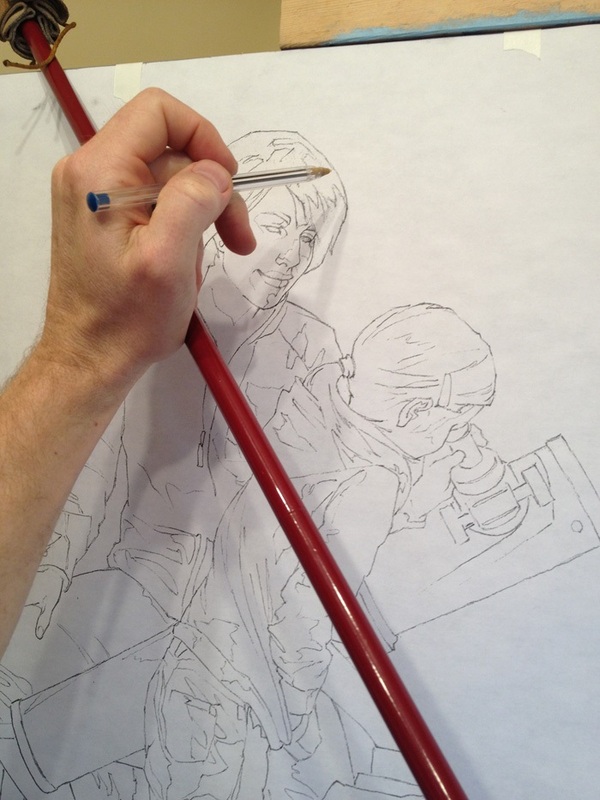 This cuts out the messy charcoal stage and double tracing work. I just ordered some Saral graphite transfer paper to see how that compares to using regular carbon paper. I’ve talked to a lot of artists that use transfer paper. If it works for you, that’s great! Using a colored pen or pencil to trace makes it easy to see where you’ve been. It definitely does. I like to use a red ballpoint pen. Hello, could you expand on the last paragraph about doing the transfer with burnt umber oil paint? I assume you brush the back of your drawing with a thinned oil paint and then position it, tape it on your canvas and trace your lines. What would you thin it with? 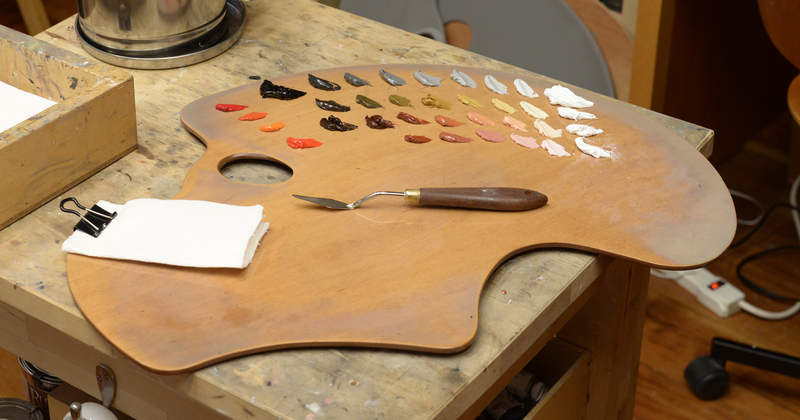 have you had success with any reddish paints? I assume a lean paint is the best choice? These days I favor straight Burnt Sienna for oil transfers, which is definitely on the red side. Yes, you would want a lean, quick drying pigment. Don’t thin the paint at all, just use straight tube color, but apply it VERY thin. Hope that helps! Haha! I guess I relied too soon too! Happy painting!